Maybe you're just there to take in the wondrous experience. Maybe you're just looking to be a sponge and soak up anything and everything you come across. Or maybe you're a woman or man on a mission this year! Almost everyone has that "one thing" that they're looking to get out of RootsTech. Maybe it's a brick wall you're trying to smash through, maybe you're trying to reconstruct the life and times of a specific person in your tree, or maybe you're looking to overcome a technical challenge that really bothered you last year. Whatever it is, the first thing you need to do is hash out exactly what you want from RootsTech this year. Your goals will guide your preparation and help mold your entire conference experience. Don't worry too much about what your goals are - just figure them out and keep them in mind when planning keynotes and classes to attend, or eyeing what exhibitors pique your interest. RootsTech attracts a wide variety of keynote speakers from far and wide - you won't just be hearing genealogists talk. Authors, journalists, historians and former government officials are on the list this year. But don't go in blind. Take a look at the list of keynote speakers right now. Maybe your favorite historian will be speaking - now you can make sure to note that as a "can't miss" event in your schedule. But the better thing to do is to find someone you're unfamiliar with and get to know their body of professional work. Read some articles, or even a book by the speaker, and you'll be so much better prepared for that talk that you'll get much more out of it. The number and variety of classes you can attend at RootsTech is paralyzing. From beginner to advanced; general to ultra-specific, it goes without saying that there is something for everyone. But trust us, finding a class that interests you isn't going to be a problem. In order to maximize the knowledge you gain from the conference, you need to start planning your classes right now. Spend some down time browsing the list and playing with the various filters to make sure you don't miss something valuable. Prepare a second or third choice for some of the time-slots. Classes fill up quickly so it's wise to have a back-up favorite just in case. Do you know that millions and millions of genealogical records (many of people who lived before 1930) are within a hop, skip & jump of the conference center? If you've never been there before, the Family History Library in Salt Lake City is an absolute must-see location. It's the largest family history library in the world and is open to the public free of charge. Did we mention the staff of hundreds that are available to help your genealogy research? As you might guess, the library gets absolutely swamped during RootsTech, but it doesn't matter - it's at least worth checking out. You may be so impressed that it's worth an entire second trip (many travel from all over the country for the chance to research here). If you don't mind the bumping elbows with fellow genealogy buffs, feel free to take the time to do some research - or come by during off-peak hours for lighter crowds. Your brain is going to suffer from information overload during RootsTech - it's not a matter of if, but when you reach capacity and stop remembering. Don't let that happen! You need to preserve every nugget of info as if it were the only copy of a valuable record! How you do it is up to you, but you absolutely must have some way to document your experience. This doesn't mean you need to turn into the conference stenographer - just make sure you have the capability in case something comes up in the moment and you want to write it down. A good old fashion notepad and pencil will do the trick for many, but the digitally inclined may do better using a smartphone app. Note taking applications are popular, but a nice little secret is to download a digital voice recorder. If you're involved in an interesting conversation or attending a groundbreaking class just hit the record button and listen to everything later. And don't forget the handy notes section on the RootsTech app! Maybe the most amazing thing of RootsTech is that you'll never find so many genealogy enthusiasts in the same place, so take some time to make friends! After all, family history is all about connections - we spend much time connecting with those from generations past, but don't neglect your contemporaries! Aside from establishing life-long friendships at the conference, you'll never have a better chance to connect with someone invaluable to your research. Finding a long-lost or distant relative who has also researched your family tree is a game-changer. But even connecting with those who have similar research interests can be fulfilling and profitable. 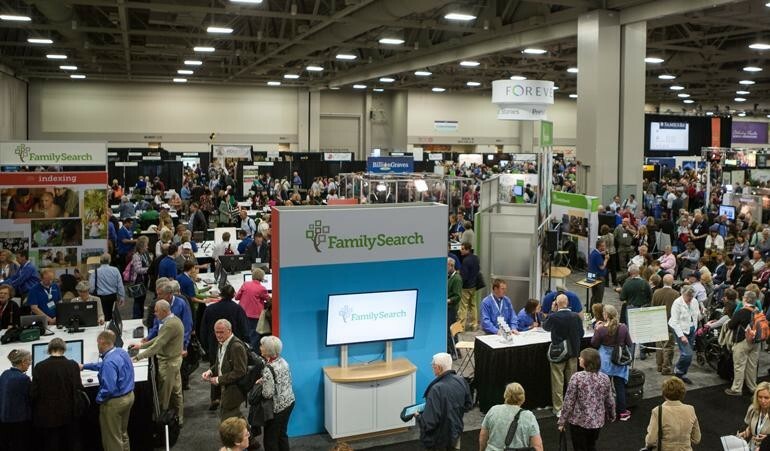 Especially if your family migrated around America, RootsTech is the perfect chance to speak with researchers and societies from distant geographic areas. If you've been to RootsTech before, you know that the expo hall is a madhouse full of delights - you can really get lost in there! 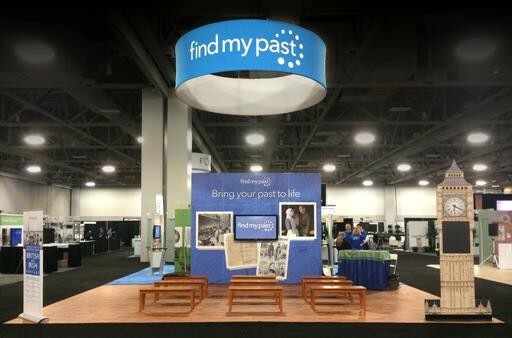 Make sure to review the list of exhibitors and see if there's anyone that piques your interest - RootsTech offers an amazing chance for some in-person samples of current and upcoming genealogy products. Many people discover things that transform their research entirely. Our recommendation is to not get too distracted on day one. Do a very general and quick lap of the entire expo hall, noting down booths you want to return to. Then zero in on your favorites on days 2 and 3 - you don't want to discover the demo of your dreams at the 11th hour of the conference! Okay, we couldn't resist this one - make sure to visit us at the expo hall! We're bringing our all-star team of genealogists with us and as always, we're the go-to folks for British and Irish family history. But 2019 is going to be so much bigger for Findmypast - from a brand new DNA experience to exciting record releases, there is lots to come and speak to us about. Genealogists will be on-hand to answer questions, and it's a great chance to get a hands-on demonstration of our site and its features. See you there!